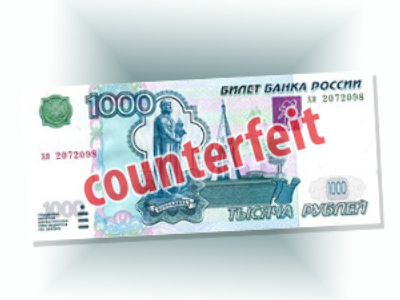 Despite all of the enhanced technology used to prevent forgers from counterfeiting currencies, nearly 140,000 forged banknotes were discovered in Russia last year, according to a report by the Bank of Russia. The majority of the forgeries were Russian roubles, with officials tallying 133,864 pieces of the worthless paper. The fake notes of foreign states amounted to 5,801. Most of the fake roubles, 72,496 to be exact, were discovered in Central Russia where many big cities, including Moscow, top the counterfeit list. Other currencies that made the counterfeit list included 13 fake Chinese Renminbi yuan, 10 Swedish krona, 6 fake British pounds, one Canadian dollar and one Swiss frank. Authorities said they discovered 618 counterfeit notes in the July, the most active month last year for fakes. The Russian 1,000 rouble note was the most popular among Russian forgers with 127,490 samples discovered. Meanwhile, forged 500 and 100 rouble notes seem to be rarer: 3,273 and 2,076, respectively. The largest rouble denomination, the 5,000 rouble note, is not very popular it seems amongst counterfeiters as only 102 were found. In the last six months of 2008, a total of 354,000 counterfeit euro notes were withdrawn from circulation in the EU alone. The exact quantity of fake US dollars worldwide remains unknown.